This island nation is a very new society, forged over the past three centuries. Although similar in many ways to neighboring Réunion and the Seychelles where there is also a mixed population of African and Indian ancestry, Mauritius actually has a much greater South and East Asian influence than these islands. But that is not the whole story: a strong French cultural and linguistic heritage persists, even though the island was taken over and ruled by Britain for a hundred and fifty-eight years, and you only have to scratch the surface of many a Mauritian custom to find its African and Malagasy roots. Although it would be difficult to claim a single overarching identity for the Mauritian people, certain traits recur in the accounts of foreign visitors: hospitality, warmth, and friendliness, albeit with an unexpected element of reserve. 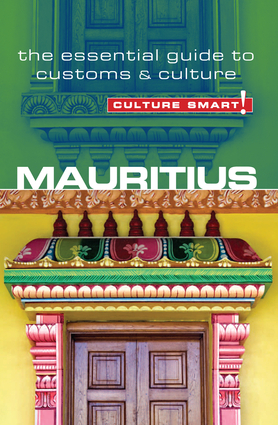 Above all, the most defining characteristic of the Mauritians is their multiculturalism. The island’s rich cultural diversity reflects the origins of the people who settled there, and Mauritian language, food, and religion form an intoxicating medley. Mauritius is not always, however, the haven of peace, love, and understanding that it may seem at first sight. The reality is more complex and nuanced. Although today many Western and European-style customs are encroaching on both private and public life, Mauritians are ambivalent about this, and ancestral traditions are still firmly established in the daily lives of the population. This book aims to make sense of the modern and the traditional, of the complex legacy of shared and ancestral cultures. It will help you to navigate your way through the contradictions of Mauritian society and to enrich your experience of this fascinating and beautiful island. As a foreigner, your attitude to Mauritian customs and culture will go a long way toward securing lasting friendships. Although many islanders will be more than capable of conversing with you in English, even a little knowledge of French and/or Kreol will go far in eliciting a positive response.